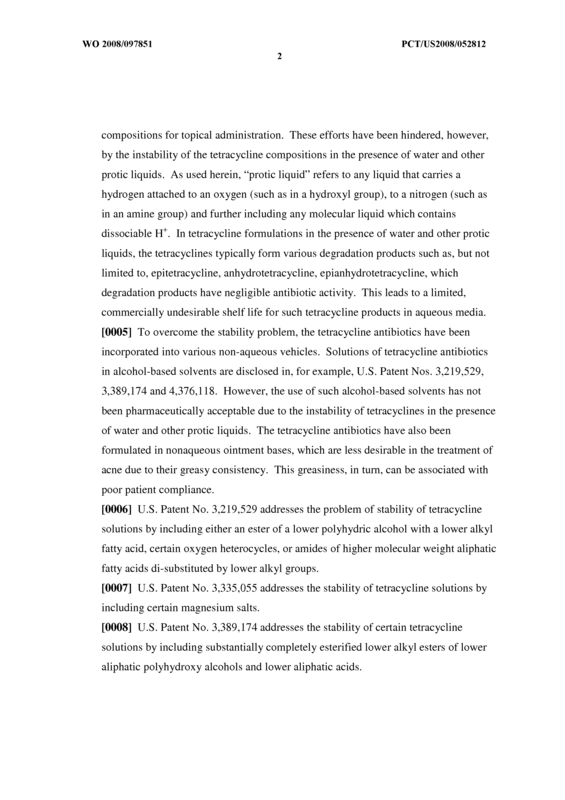 Pharmaceutical formulations containing tetracycline for topical administration, as well as methods of making and administering the same, are disclosed. 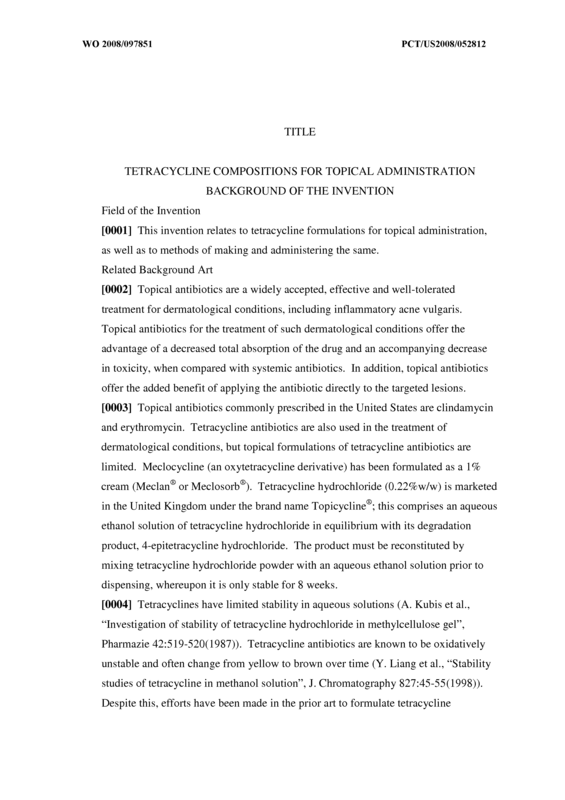 A tetracycline formulation for topical administration comprising at least one tetracycline or a pharmaceutically acceptable salt or hydrate thereof substantially stabilized in a base, wherein the base comprises at least one hydrophobic, non-hygroscopic silicone thickening agent, and wherein the formulation is substantially free of pro tic liquids. 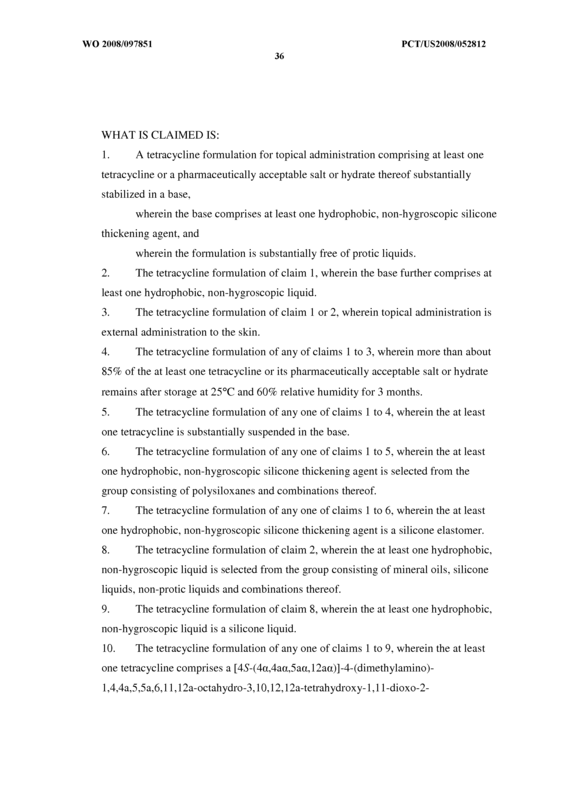 The tetracycline formulation of claim 1, wherein the base further comprises at least one hydrophobic, non-hygroscopic liquid. 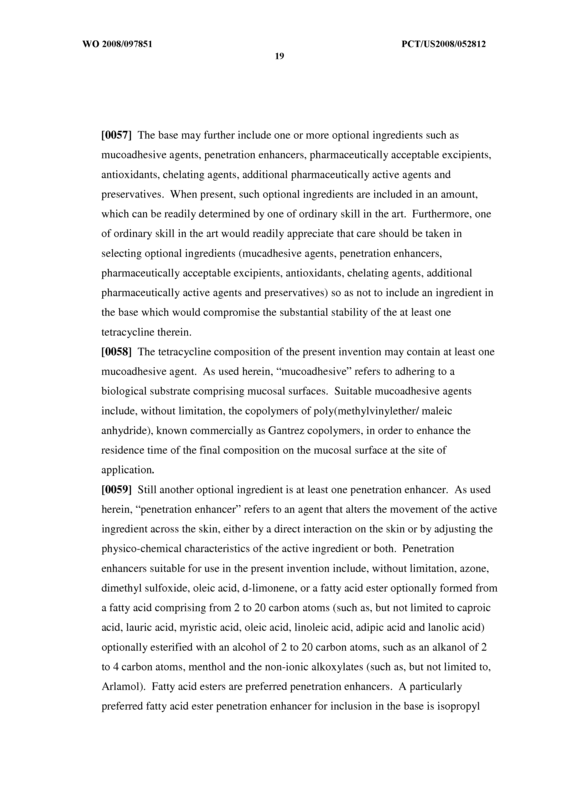 The tetracycline formulation of claim 1 or 2, wherein topical administration is external administration to the skin. 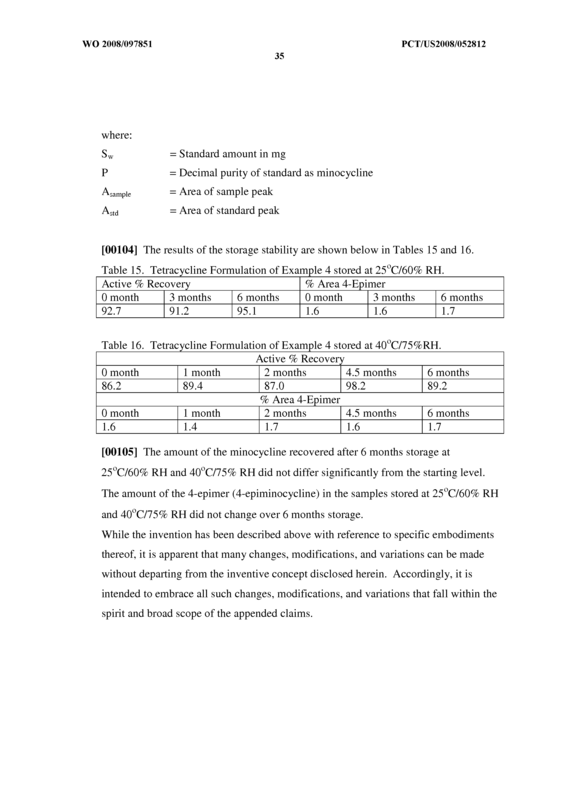 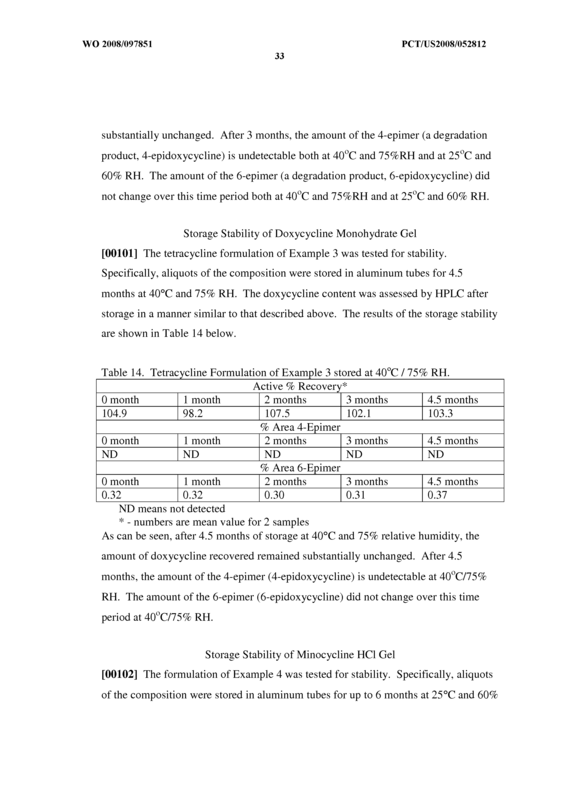 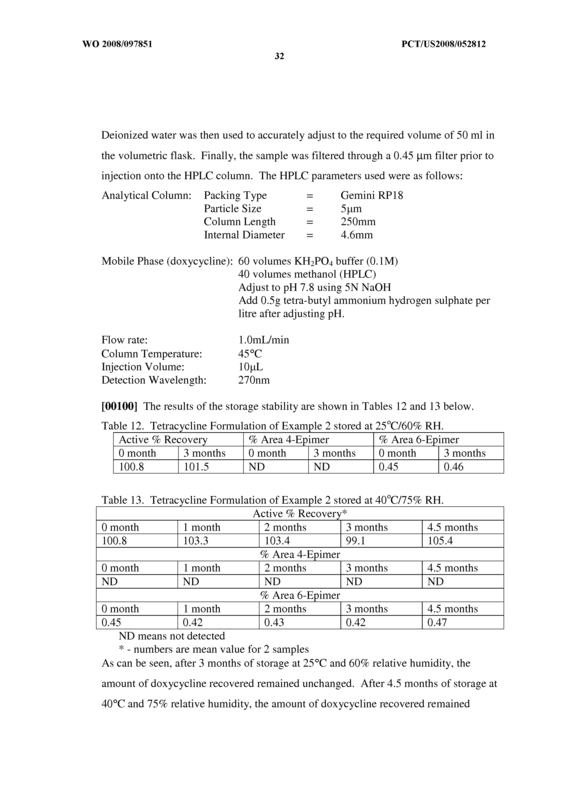 The tetracycline formulation of any of claims 1 to 3, wherein more than about 85% of the at least one tetracycline or its pharmaceutically acceptable salt or hydrate remains after storage at 25°C and 60% relative humidity for 3 months. 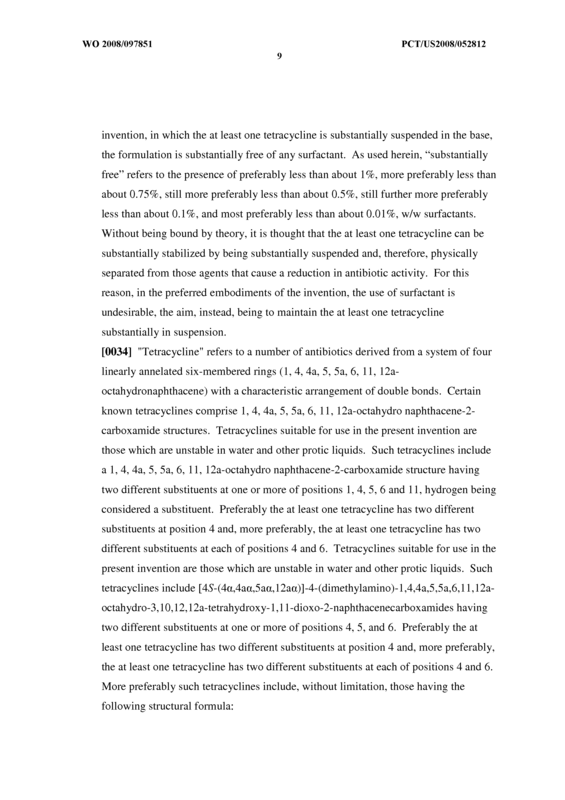 The tetracycline formulation of any one of claims 1 to 4, wherein the at least one tetracycline is substantially suspended in the base. 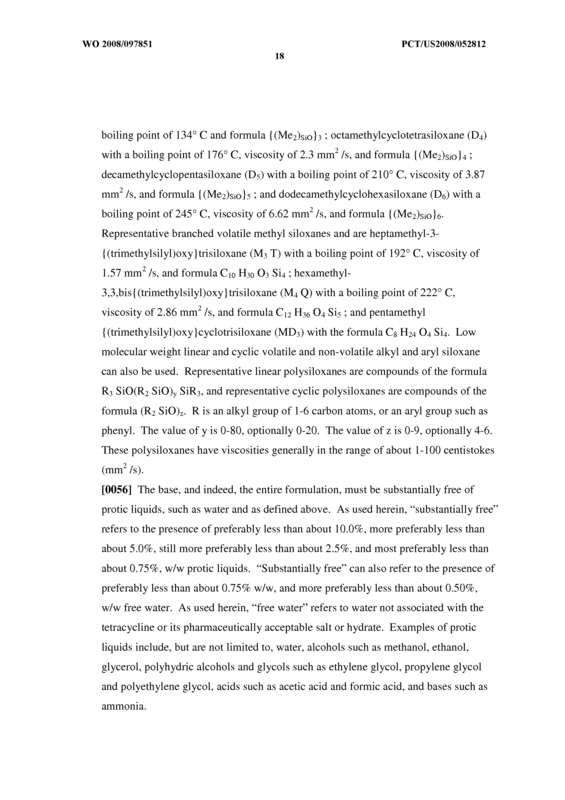 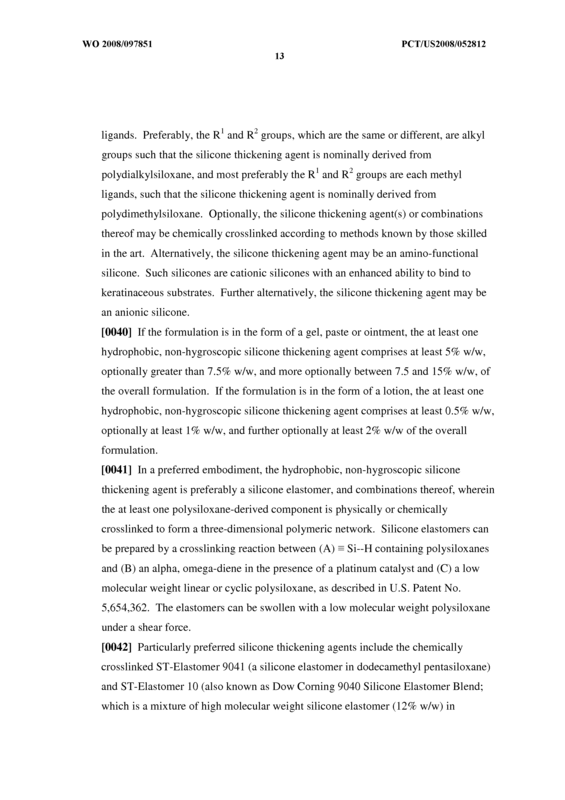 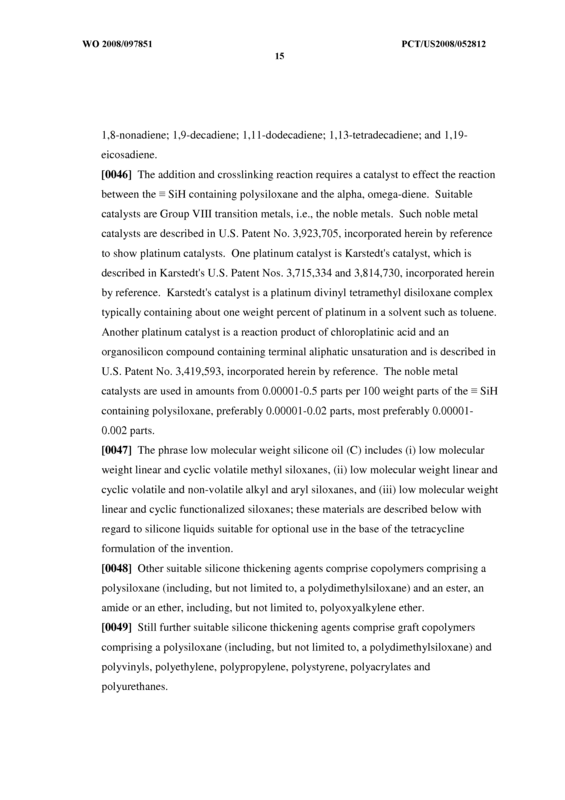 The tetracycline formulation of any one of claims 1 to 5, wherein the at least one hydrophobic, non-hygroscopic silicone thickening agent is selected from the group consisting of polysiloxanes and combinations thereof. 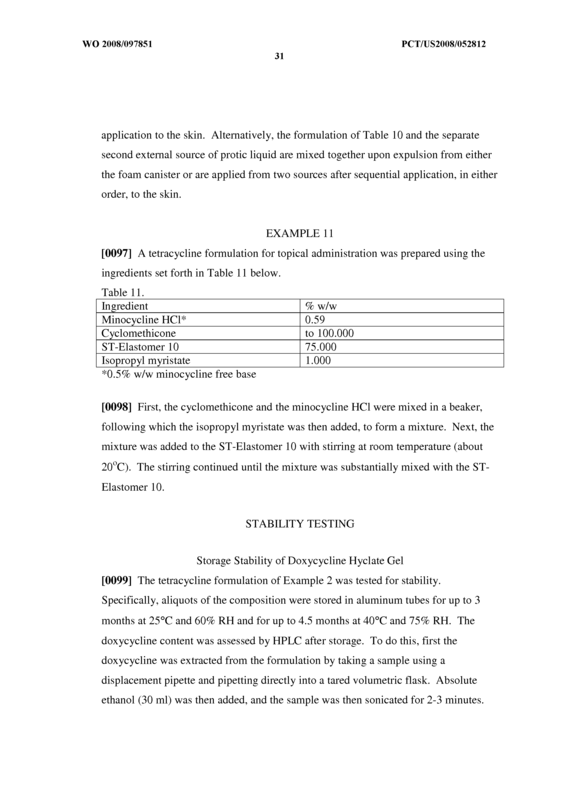 The tetracycline formulation of any one of claims 1 to 6, wherein the at least one hydrophobic, non-hygroscopic silicone thickening agent is a silicone elastomer. 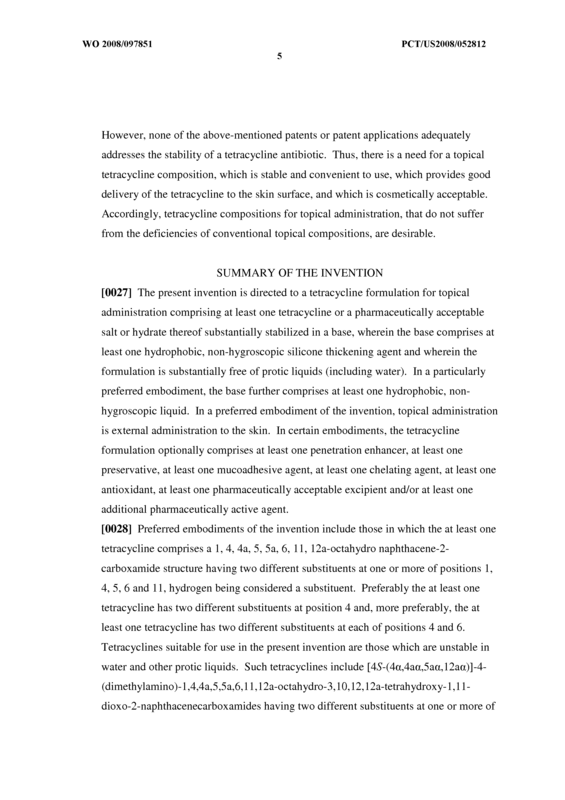 The tetracycline formulation of claim 2, wherein the at least one hydrophobic, non-hygroscopic liquid is selected from the group consisting of mineral oils, silicone liquids, non-pro tic liquids and combinations thereof. 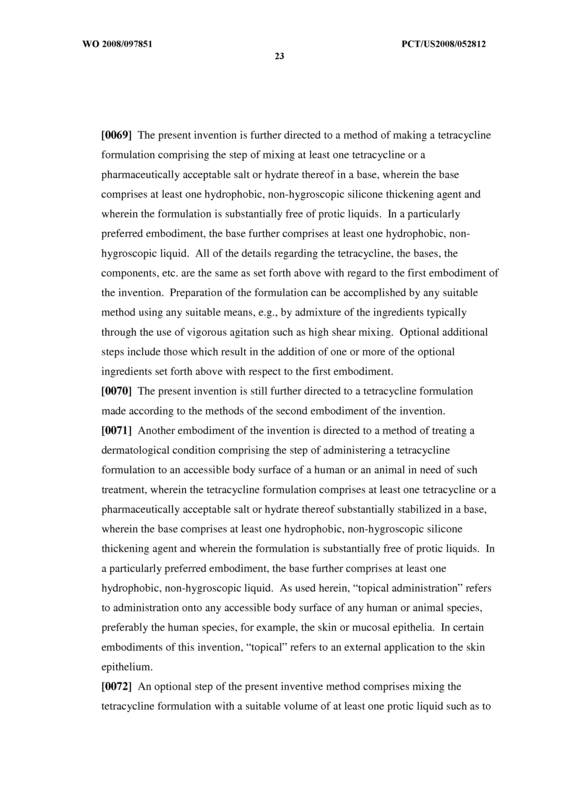 The tetracycline formulation of claim 8, wherein the at least one hydrophobic, non-hygroscopic liquid is a silicone liquid. 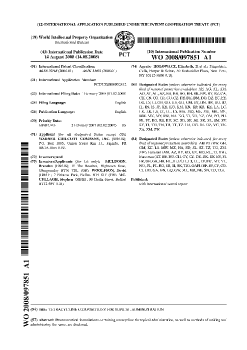 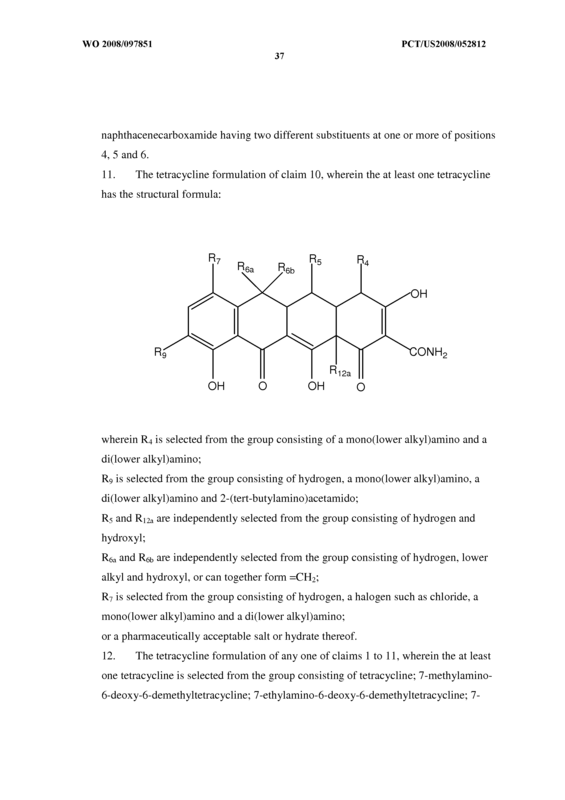 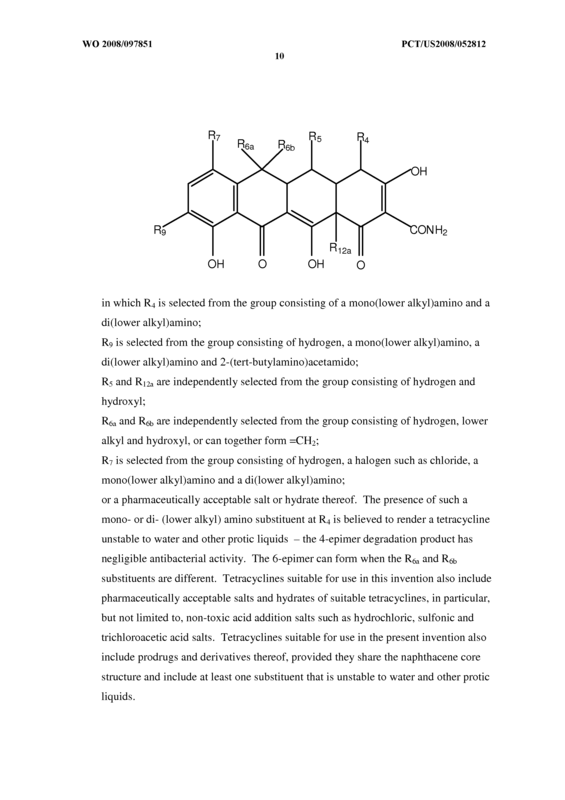 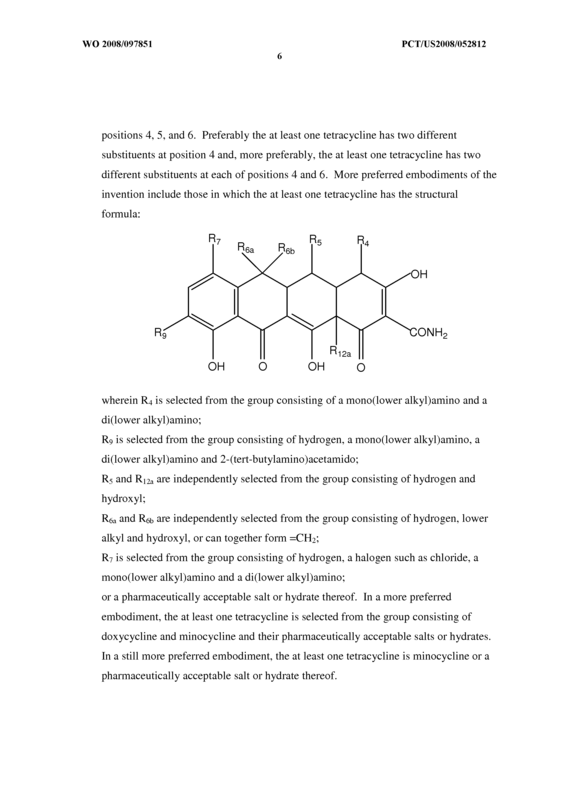 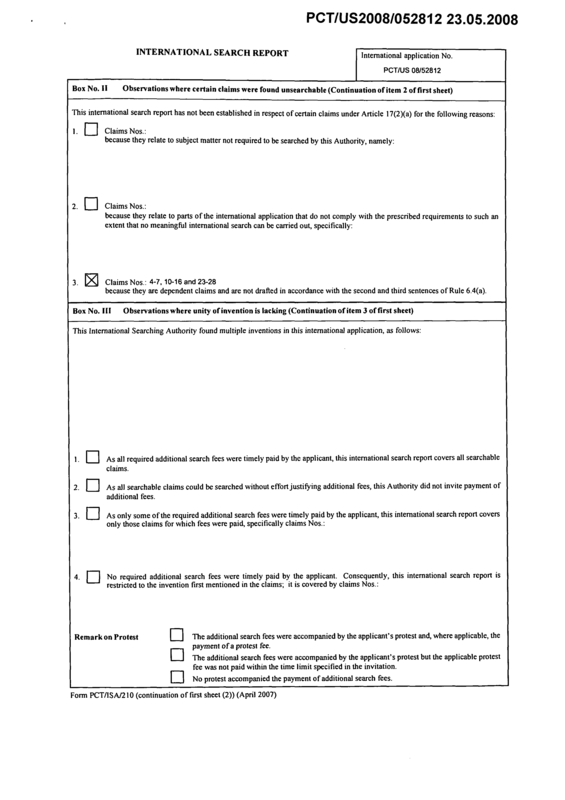 The tetracycline formulation of any one of claims 1 to 9, wherein the at least one tetracycline comprises a [45r-(4α,4aα,5aα,12aα)]-4-(dimethylamino)- l,4,4a,5,5a,6,l l,12a-octahydro-3,10,12,12a-tetrahydroxy-l,l l-dioxo-2- naphthacenecarboxamide having two different substituents at one or more of positions 4, 5 and 6. 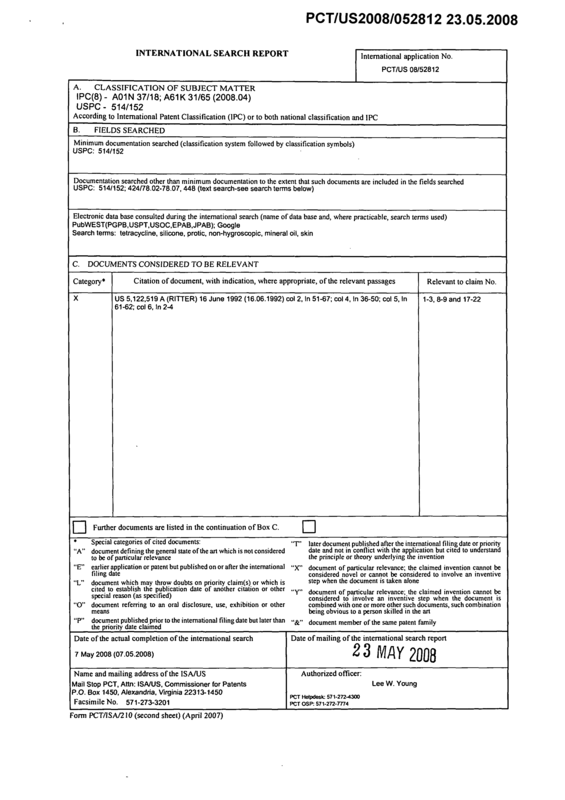 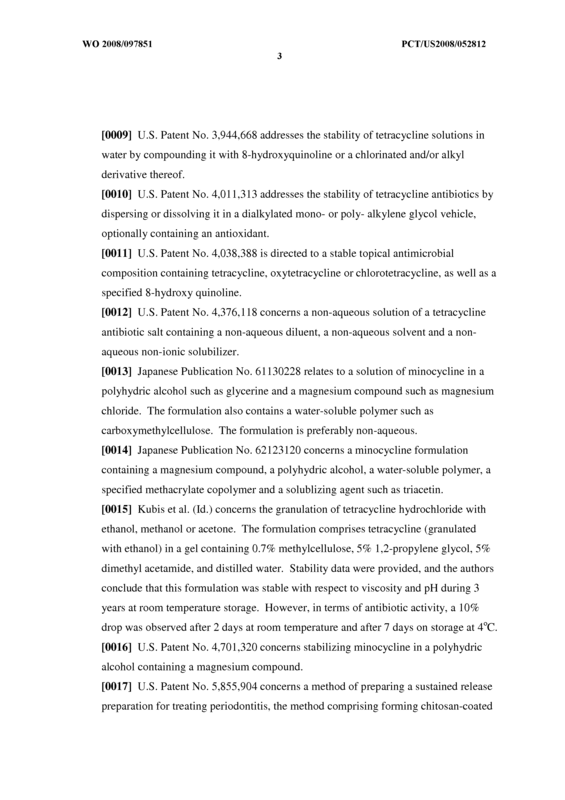 R7 is selected from the group consisting of hydrogen, a halogen such as chloride, a mono(lower alkyl)amino and a di(lower alkyl)amino; or a pharmaceutically acceptable salt or hydrate thereof. 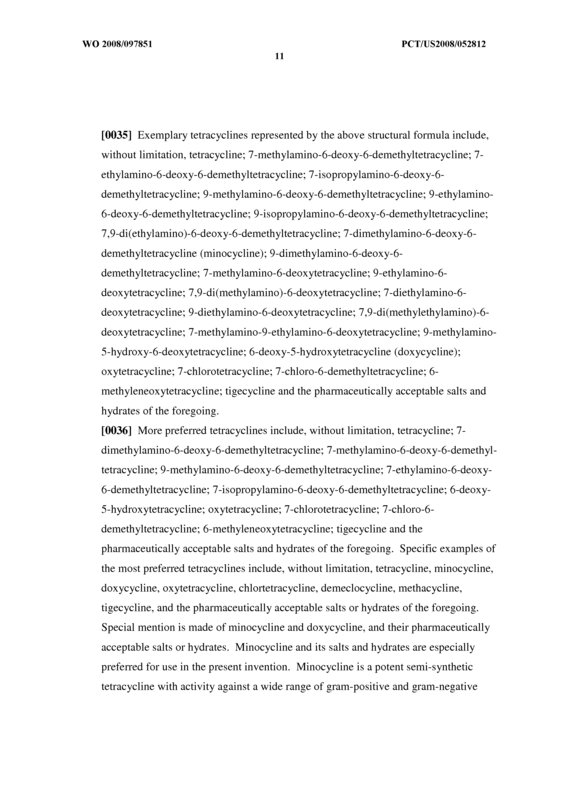 6-deoxy-6-demethyltetracycline; V-ethylamino-β-deoxy-β-demethyltetracycline; 7- isopropylamino-β-deoxy-β-demethyltetracycline; 9-methylamino-6-deoxy-6- demethyltetracycline; 9-ethylamino-6-deoxy-6-demethyltetracycline; 9- isopropylamino-6-deoxy-6-demethyltetracycline; 7,9-di(ethylamino)-6-deoxy-6- demethyltetracycline; 7-dimethylamino-6-deoxy-6-demethyltetracycline; 9- dimethylamino-6-deoxy-6-demethyltetracycline; 7-methylamino-6-deoxytetracycline; 9-ethylamino-6-deoxytetracycline; 7,9-di(methylamino)-6-deoxytetracycline; 7- diethylamino-6-deoxytetracycline; 9-diethylamino-6-deoxytetracycline; 7,9- di(methylethylamino)-6-deoxytetracycline; 7-methylamino-9-ethylamino-6- deoxytetracycline; 9-methylamino-5-hydroxy-6-deoxytetracycline; 6-deoxy-5- hydroxytetracycline; oxytetracycline; 7-chlorotetracycline; 7-chloro-6- demethyltetracycline; 6-methyleneoxytetracycline; tigecycline and the pharmaceutically acceptable salts and hydrates. 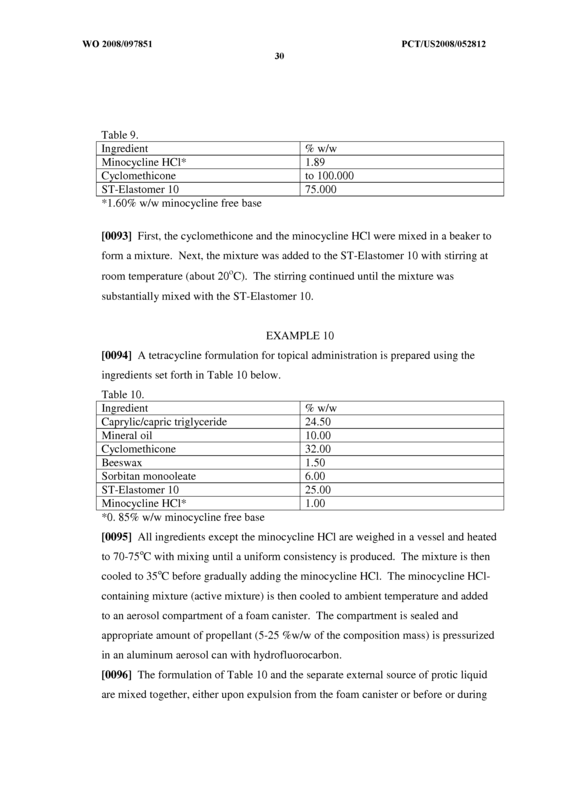 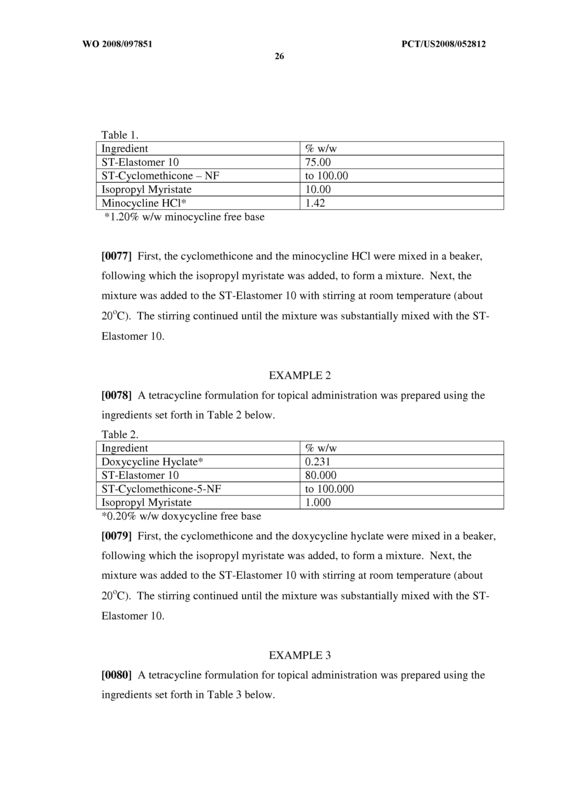 The tetracycline formulation of claim 12, wherein the at least one tetracycline is selected from the group consisting of minocycline, doxycycline and the pharmaceutically acceptable salts and hydrates of minocycline and doxycycline. 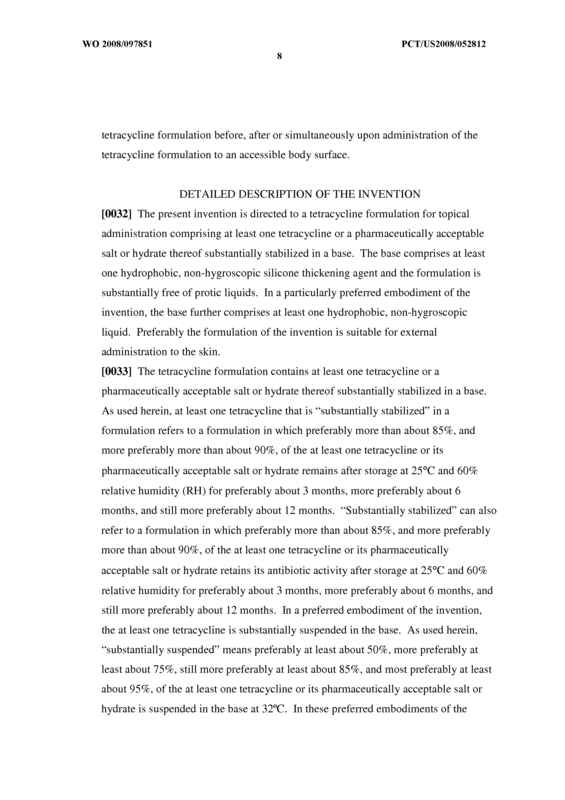 The tetracycline formulation of any one of claims 1 to 13, wherein the at least one tetracycline is employed in an amount ranging from about 0.00001% to about 10% by weight of the tetracycline formulation. 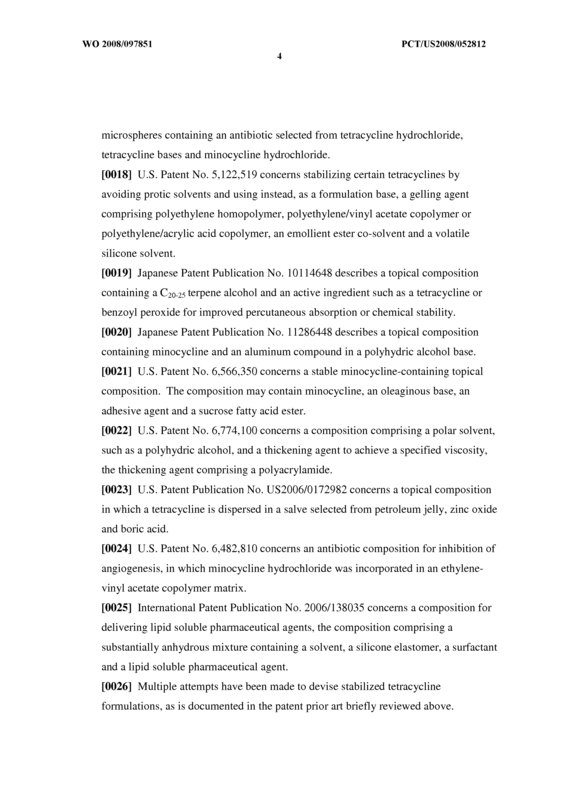 The tetracycline formulation of any one of claims 1 to 14 further comprising at least one optional ingredient selected from the group consisting of mucoadhesive agents, penetration enhancers, antioxidants, chelating agents, additional pharmaceutically active agents, preservatives and pharmaceutically acceptable excipients. 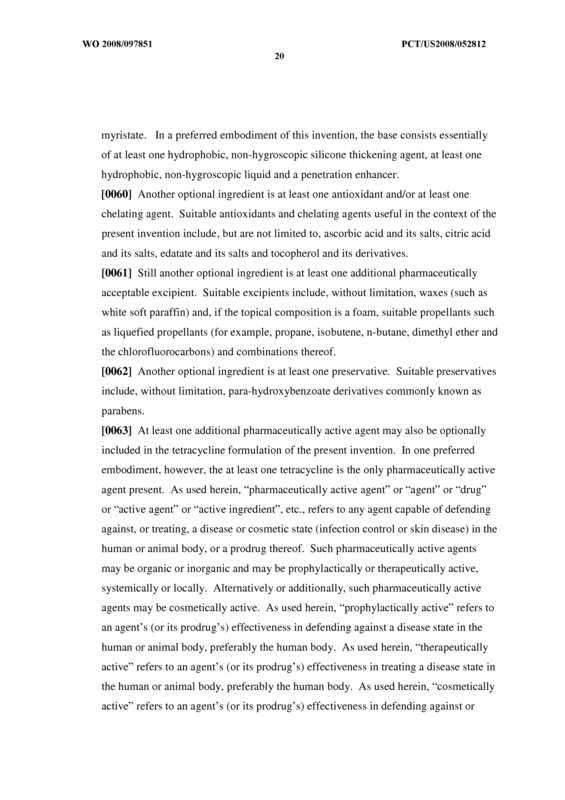 The tetracycline formulation of claim 15, wherein the additional pharmaceutically active agent is selected from the group consisting of antiinflammatory compounds, antimicrobials, benzoyl peroxide, azelic acid, retinoids, immunomodulators, and calcineurin antagonists. 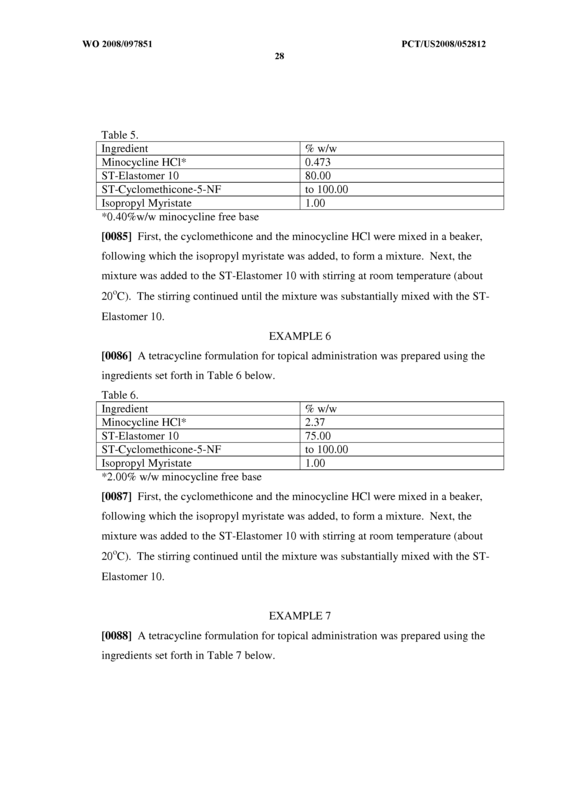 A method of making a tetracycline formulation comprising the step of mixing at least one tetracycline or a pharmaceutically acceptable salt or hydrate thereof in a base, wherein the base comprises at least one hydrophobic, non-hygroscopic silicone thickening agent, and wherein the formulation is substantially free of pro tic liquids. 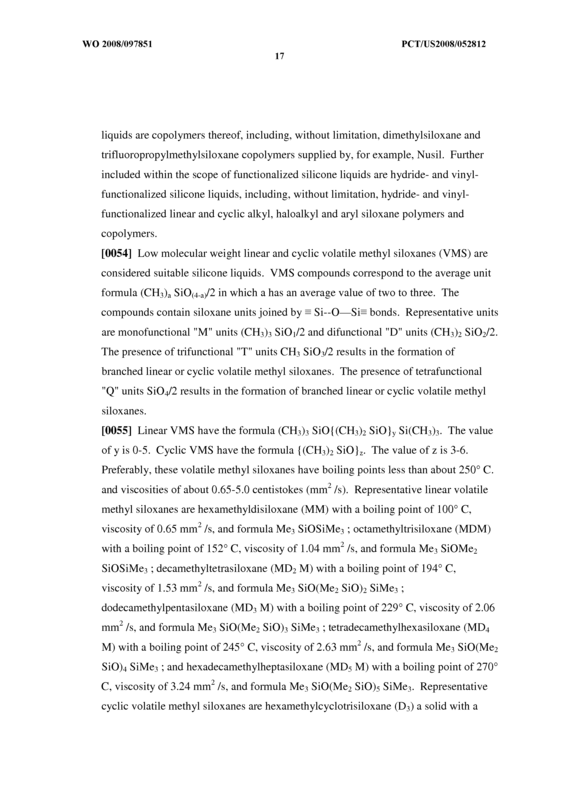 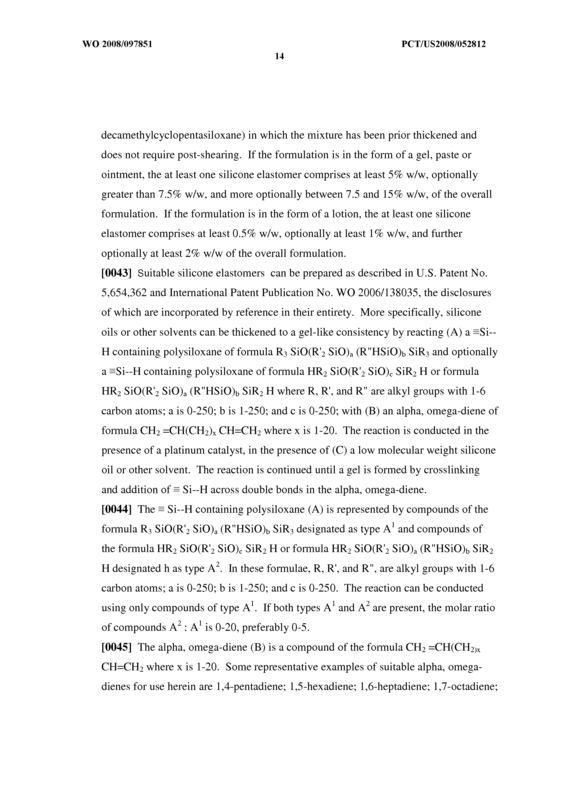 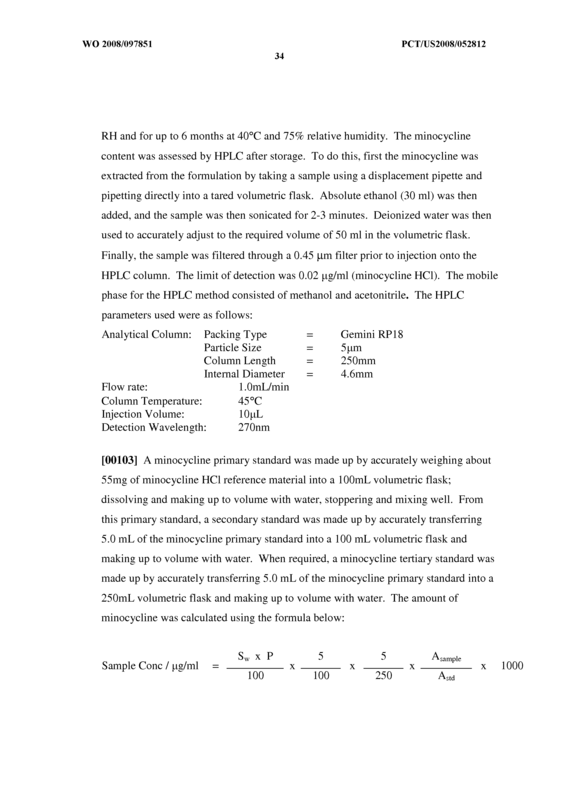 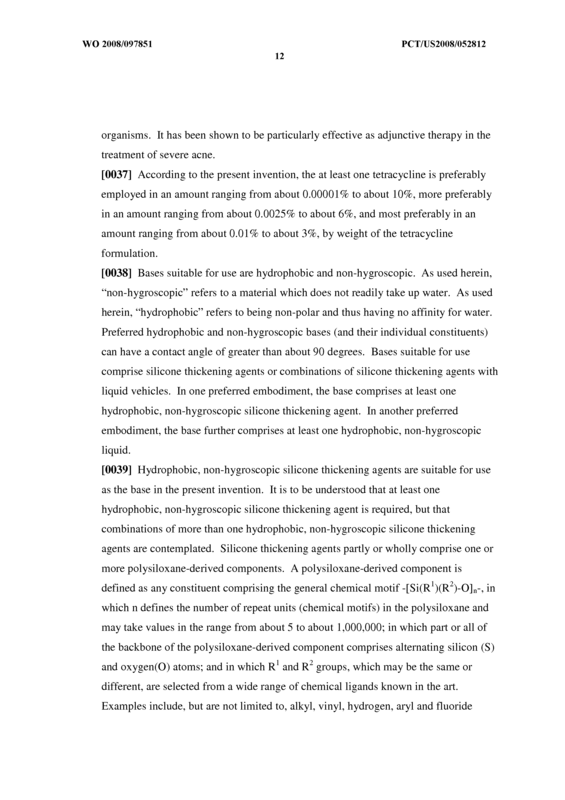 The method of claim 17, wherein the base further comprises at least one hydrophobic, non-hygroscopic liquid. 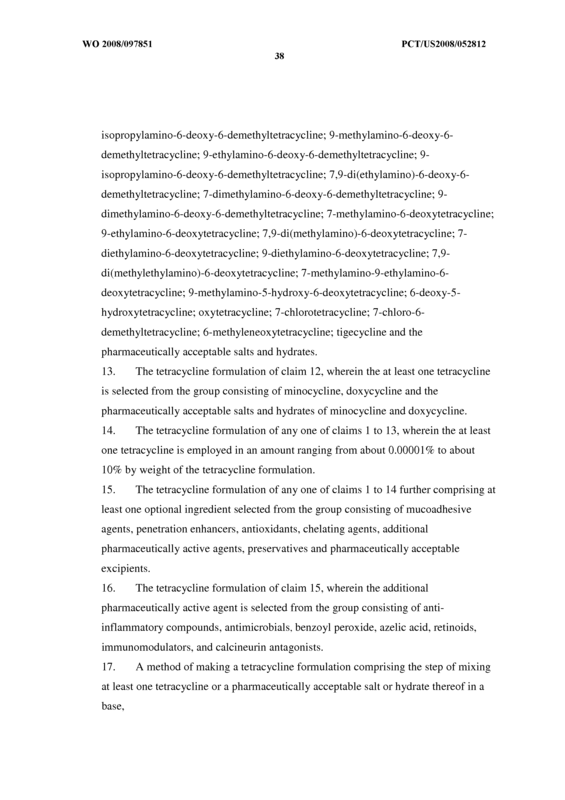 A tetracycline formulation made according to the method of claim 17 or 18. 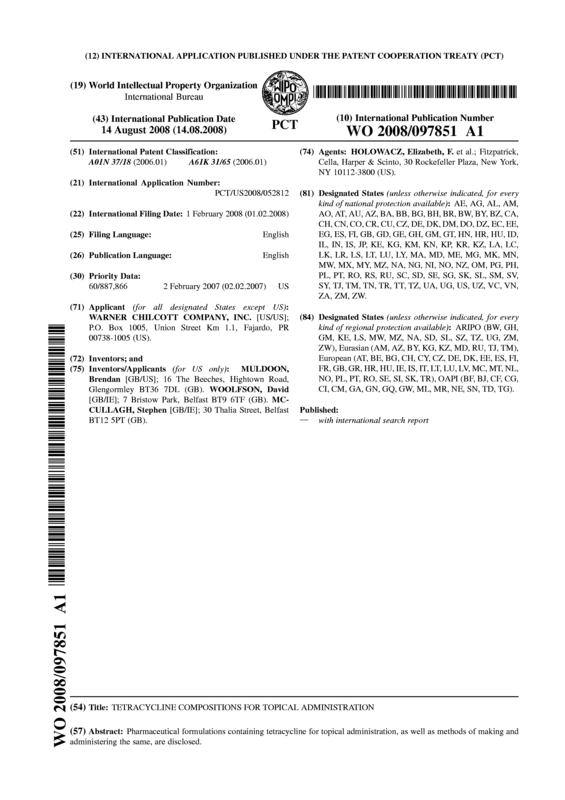 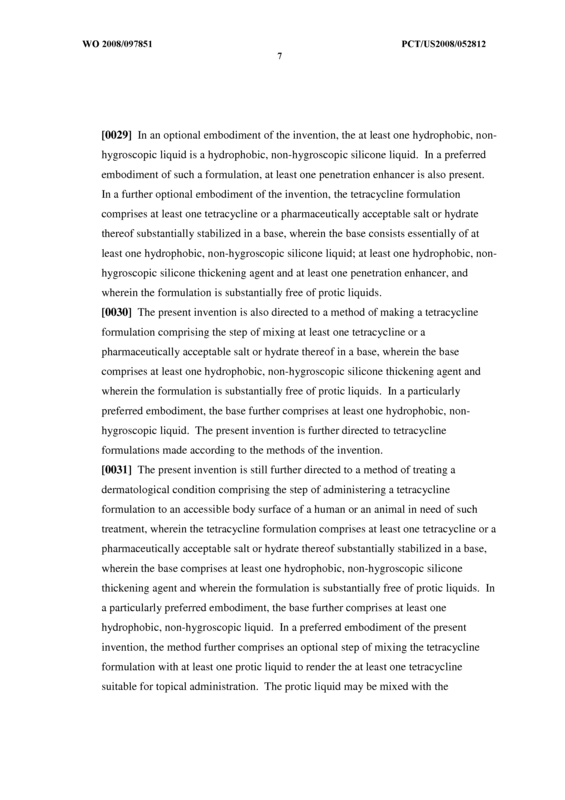 A method of treating a dermatological condition comprising the step of: administering a tetracycline formulation to an accessible body surface of a human or an animal in need of such treatment, wherein the tetracycline formulation comprises at least one tetracycline or a pharmaceutically acceptable salt or hydrate thereof substantially stabilized in a base, wherein the base comprises at least one hydrophobic, non-hygroscopic silicone thickening agent, and wherein the formulation is substantially free of pro tic liquids. 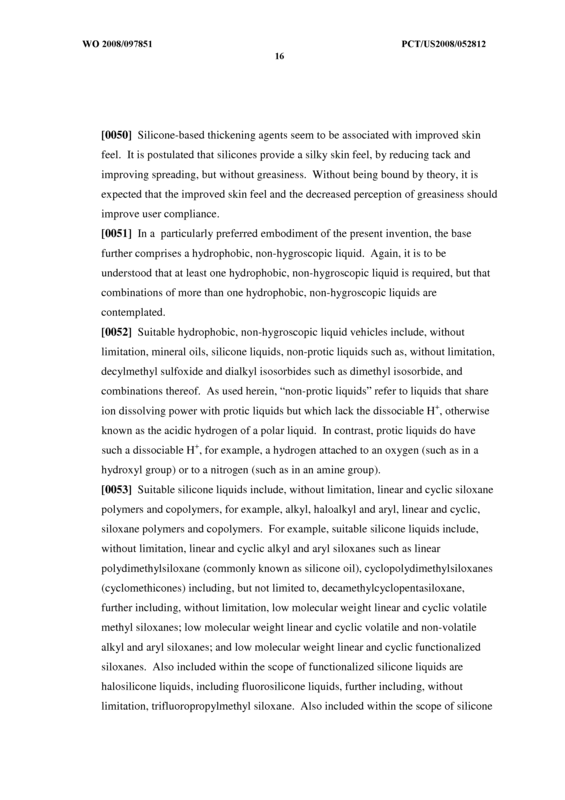 The method of claim 20, wherein the base further comprises at least one hydrophobic, non-hygroscopic liquid. 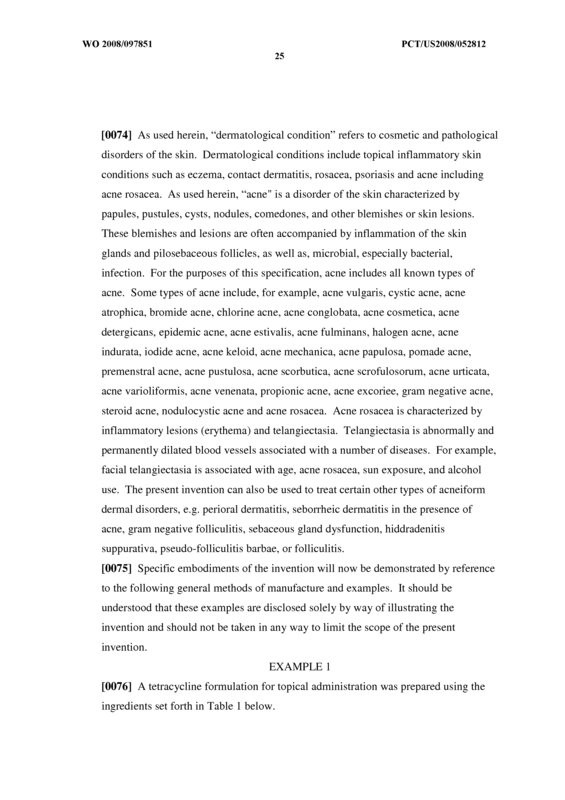 The method of claim 20 or 21, wherein the topical administration is external administration to the skin. 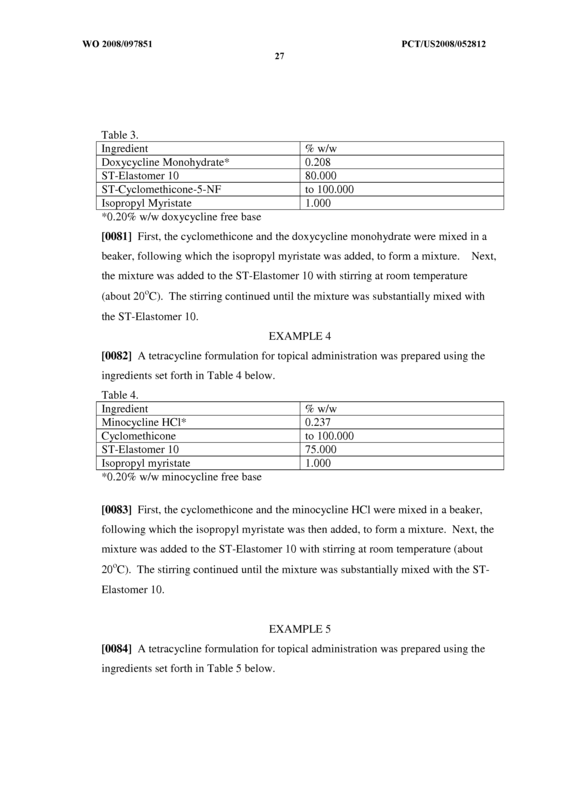 The method of any one of claims 20 to 22 further comprising the step of mixing the tetracycline formulation with at least one protic liquid to render the at least one tetracycline suitable for topical administration. 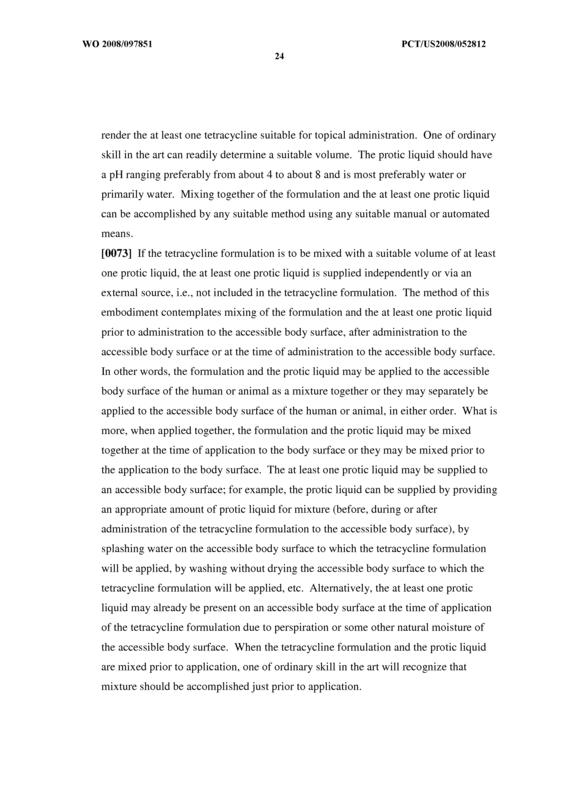 The method of claim 23, wherein the at least one protic liquid is mixed with the tetracycline formulation prior to administration to the accessible body surface. 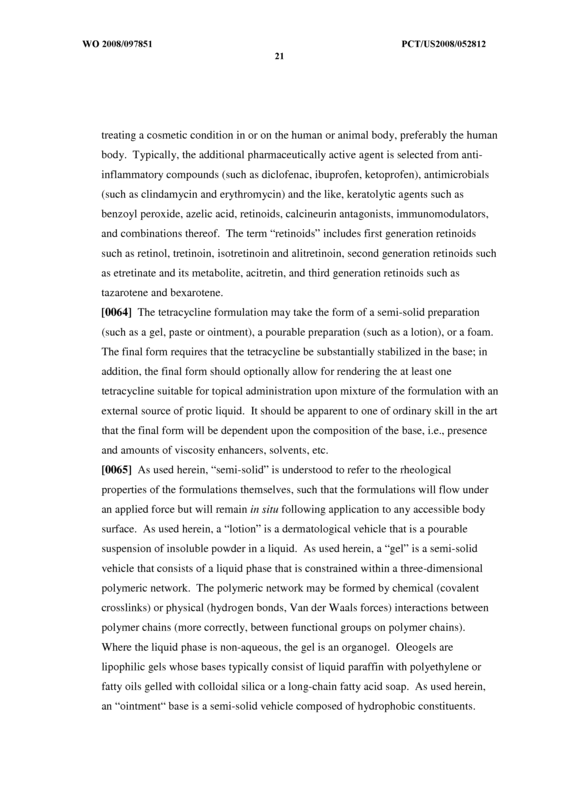 The method of claim 23, wherein the at least one protic liquid is mixed with the tetracycline formulation after administration to the accessible body surface. 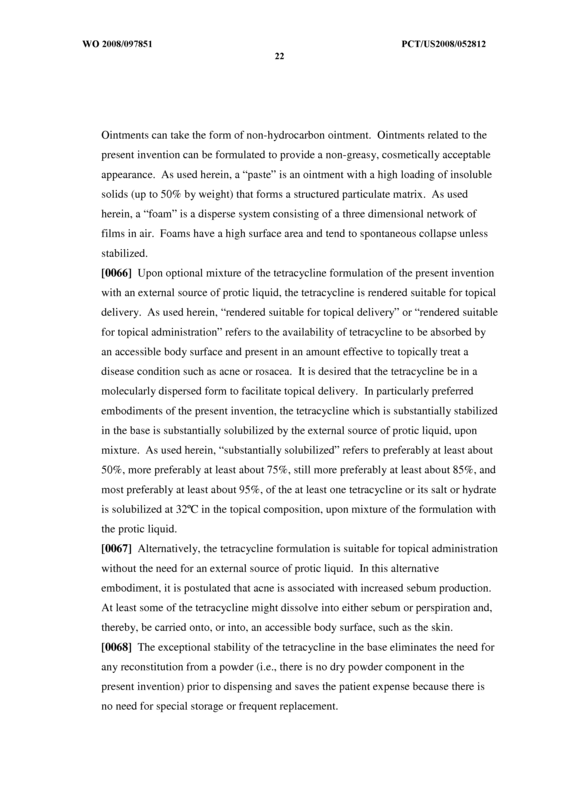 The method of claim 23, wherein the at least one protic liquid is mixed with the tetracycline formulation at the time of administration to the accessible body surface. 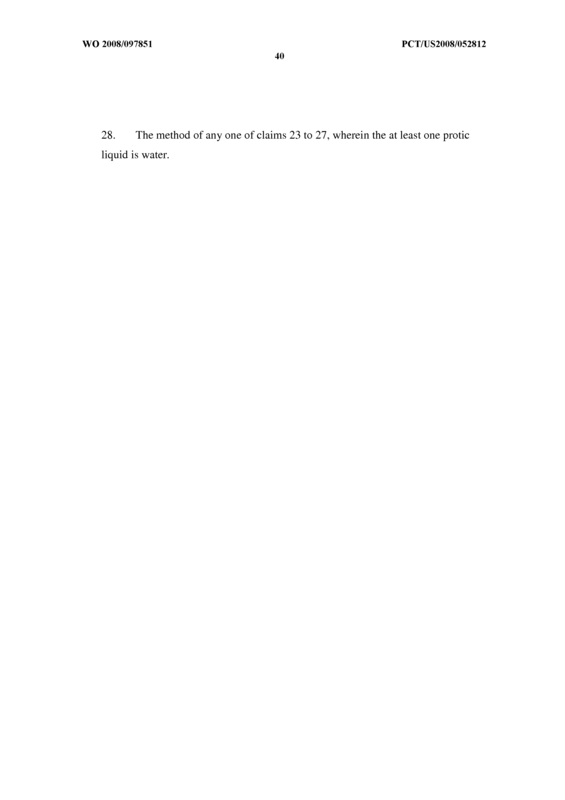 The method of any one of claims 23 to 26, wherein the at least one protic liquid is provided by an external source of protic liquid. 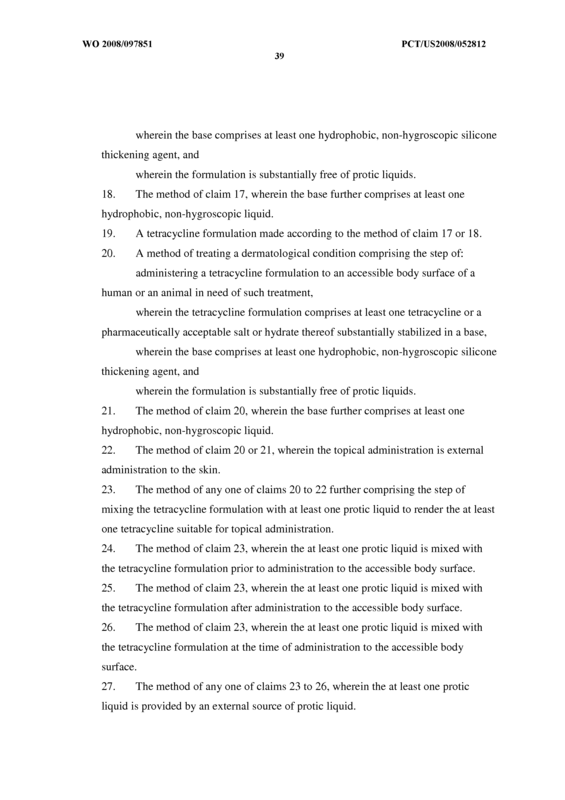 The method of any one of claims 23 to 27, wherein the at least one pro tic liquid is water.